Today – Sept. 1, 2015 – is significant in the bourbon world because it is the first day of National Bourbon Heritage Month. 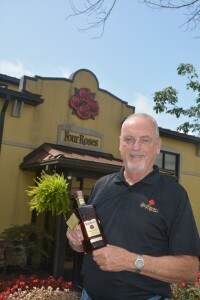 But there’s another reason today is significant: As of today, Jim Rutledge is no longer master distiller of Four Roses. After 49 years in the business, he has retired, replaced by protege Brent Elliot. No one can say that Jim hasn’t earned a chance to take it easy. After Seagram’s consigned Four Roses bourbon – once one of the most well-known brands in America – to foreign markets in the late 1950s and replaced it with blended dreck that almost killed the name, Jim devoted himself to “bringing the bourbon back.” He finally succeeded in 2002, when Kirin acquired the company. And then he set about rebuilding its reputation, first with the Single Barrel and then with the Small Batch. In both 2012 and 2013, Whisky Advocate named his Limited Edition Small Batch bourbons American Whiskey of the Year, and that 2013 LE Small Batch, which commemorated Four Roses’ 125th anniversary, is still among the best bourbons I’ve ever tasted. And yet I’ve never heard Jim brag – about himself. Oh, he’ll brag about the brand, and he’ll brag about the distillery employees who make it. But he’s one of the most self-effacing people I’ve had the pleasure of meeting. Congratulations, Jim. May your days be mellow, and may your finish be long and sweet.